Lim + Lu, the New York-founded multidisciplinary design practice, announces the transformation of a 1,200 square feet vacation-like haven that was previously abandoned for over 15 years in Hong Kong’s Quarry Bay neighborhood. The story is a fascinating one. The flat’s previous owner, who resided in the apartment for most of his life, left Hong Kong over 15 years ago and left everything behind. When Lim + Lu visited the site last year, it seemed like time had stood still. Everything had been kept exactly in its original location, reminiscent of a classic Wong Kar Wai movie. The new owners, one of them is co-founder of boutique developer District 15, are no stranger to refitting old properties. They are also a nature-loving couple with a passion for relics. Their sentiment towards the building’s old characteristics remains true. 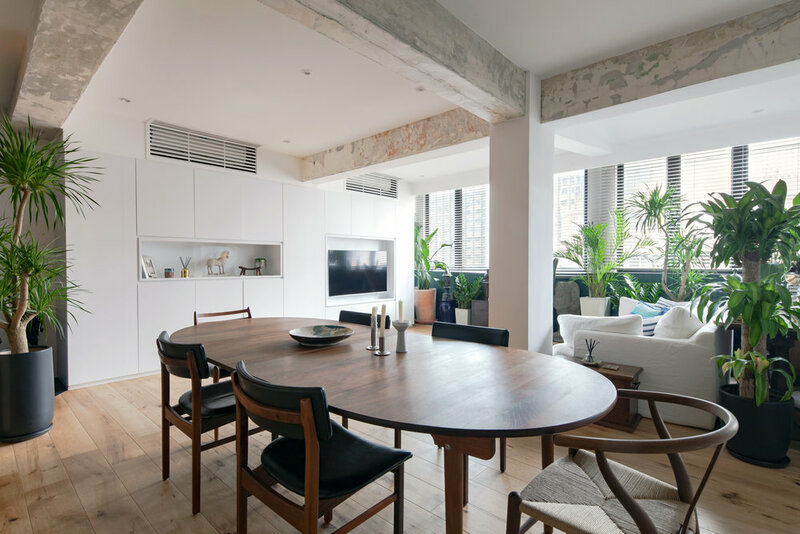 As a result, Lim + Lu decided that the chipped concrete beams throughout the apartment were to remain untouched. The faded jade and orange hue beams juxtaposed with the new pristine white walls, and complements the warm palette of oak and brass accents throughout the apartment. More so, the couple wished for the apartment to be awash with elements of surprise, things unique to this apartment and this apartment alone. “The idea that time could be used as part of the material palette was incredibly poetic” says Lim + Lu co-founder Vince Lim, adding that the space contained a patina that could not be replicated with modern processes. Located on the major artery of a densely populated area, the apartment has direct sightlines into apartment units and offices across the street. For this reason, Lim + Lu focused on creating internal views the couple could enjoy. 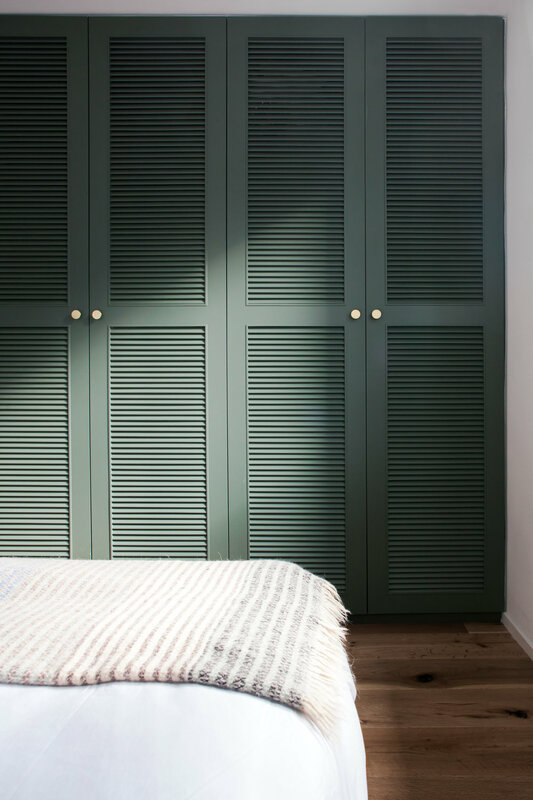 Upon entry of the revamped 1,200 square feet apartment, one is greeted by a full-height oak slat shoe closet with a puncture carved out and finished in brass. The window acts as a valet at the entrance, but more importantly, offers a glimpse of the open kitchen on the other side. Framing devices populate the apartment’s walls to offer moments of emphasis on relics from the couple’s travel adventures. The brief prepared by the client read: “When we enter the apartment, we want to forget about where we are in the world and leave the city behind us.” Lim + Lu decided to bring elements of nature into the space, transforming this new home into a haven to escape from the fast-paced lifestyle of the hustle and bustle of Hong Kong. The view of offices and apartments across the street from the living room windows are replaced by a row of lush greenery. The aesthetic is clean, fresh, and sophisticated. Pairing materials such as warm oak, woven wicker, and volcanic slate allows inhabitants and visitors alike to be transported to an island getaway.